Summary: Mini-brains that are able to grow blood vessels are paramount for future investigation of neurological disorders, researchers report. 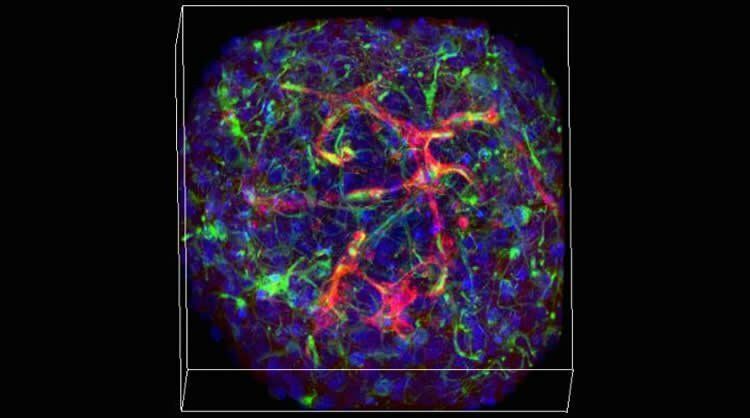 Scientists have recently made a wondrous variety of mini-brains — 3-D cultures of neural cells that model basic properties of living brains — but a new finding could add to the field’s growing excitement in an entirely new “vein”: Brown University’s mini-brains now grow blood vessels, too. The networks of capillaries within the little balls of nervous system cells could enable new kinds of large-scale lab investigations into diseases, such as stroke or concussion, where the interaction between the brain and its circulatory system is paramount, said Diane Hoffman-Kim, senior author of the study in The Journal of Neuroscience Methods. More fundamentally, vasculature makes mini-brains more realistic models of natural noggins. Especially because scientists can make them by the hundreds, mini-brains hold promise not only for advancing medical and scientific research, but also for doing so with less need for animal models. Hoffman-Kim’s lab first described its mini-brain method in 2015. While the engineered tissues appeared relatively simple compared to some others, they were also relatively easy and inexpensive to make. The new study features a wide variety of imaging experiments in which staining and fluorescence techniques reveal those different cell types and proteins within the mini-brain spheres. The study also documents their integration with the neural tissues. Cross-sections under a transmission electron microscope, meanwhile, show that the capillaries are indeed hollow tubes that could transport blood. Of course, there is no blood in a tiny mini-brain, Hoffman-Kim said. They exist in an agarose wellplate, not in a living animal. But she’s currently working with a colleague at Brown to design a way to connect the mini-brains with a microfluidic apparatus that could produce an external source of circulation through a mini-brain. “We’ve sketched on a few napkins together,” she quipped. The capillary networks are not as dense as they would be in a real brain, she acknowledged. The study also shows that they don’t last longer than about a week or two. Aware of both their constraints and their potential, Hoffman-Kim’s lab has already started experiments to take advantage of the presence of vasculature. Study second author Liana Kramer, a Brown senior, has begun looking at what happens to the vasculature and neural cells when mini-brains are deprived of oxygen or glucose. Later that same test bed could be used to examine the difference that different drugs or other treatments make. Vasculature is particularly important not only because it delivers oxygen, glucose and medicine to brain cells, but also because research shows that in strokes, Alzheimer’s disease and brain injury, the brain sometimes attempts to redesign its vasculature to compensate for what’s happening to it. The mini-brains could allow researchers to observe such responses amid different lab-created conditions and treatments, Hoffman-Kim said. “We can study a range of injury conditions, several drugs that are being tested and several conditions — such as stroke and diabetes — together,” she said. In addition to Boutin, who is now at the National Institutes of Health (NIH), Hoffman-Kim and Kramer, the paper’s other authors are Liane Livi, Tyler Brown and Christopher Moore. Funding: Funding from the National Science Foundation, NIH, Brown University, Brown alumna Donna McGraw Weiss and Jason Weiss, and the Association of Migraine Disorders supported the research. Image Source: NeuroscienceNews.com image is credited to Hoffman-Kim lab/Brown University. Brown “With Mini-Vessels, Mini-Brains Expand Research Potential.” NeuroscienceNews. NeuroscienceNews, 5 February 2017. Brown “With Mini-Vessels, Mini-Brains Expand Research Potential.” http://neurosciencenews.com/mini-brain-research-6062/ (accessed February 5, 2017). In vitro three-dimensional neural spheroid models have an in vivo-like cell density, and have the potential to reduce animal usage and increase experimental throughput. The aim of this study was to establish a spheroid model to study the formation of capillary-like networks in a three-dimensional environment that incorporates both neuronal and glial cell types, and does not require exogenous vasculogenic growth factors. We created self-assembled, scaffold-free cellular spheroids using primary-derived postnatal rodent cortex as a cell source. The interactions between relevant neural cell types, basement membrane proteins, and endothelial cells were characterized by immunohistochemistry. Transmission electron microscopy was used to determine if endothelial network structures had lumens. Endothelial cells within cortical spheroids assembled into capillary-like networks with lumens. Networks were surrounded by basement membrane proteins, including laminin, fibronectin and collagen IV, as well as key neurovascular cell types. Existing in vitro models of the cortical neurovascular environment study monolayers of endothelial cells, either on transwell inserts or coating cellular spheroids. These models are not well suited to study vasculogenesis, a process hallmarked by endothelial cell cord formation and subsequent lumenization. The neural spheroid is a new model to study the formation of endothelial cell capillary-like structures in vitro within a high cell density three-dimensional environment that contains both neuronal and glial populations. This model can be applied to investigate vascular assembly in healthy or disease states, such as stroke, traumatic brain injury, or neurodegenerative disorders.